Well look at that, it's time for season nine! With lame rhymes and all! After last season's finale, we were left with the angels falling, Sam collapsing, and Castiel without his grace. And that's pretty much where things pick right back up. I am an angel, so I must speak in formal, clipped speech. Sam is much worse off than perhaps anyone thought. Dean's resorted to taking him to a hospital, and basically the doctor is telling him that there's no hope, he's pretty much a vegetable. Said doctor also makes a remark about it being in GAHHG's hands, which of course pisses Dean off right quick. But it does give him an idea. There are many angels about now, which means that perhaps one of them can help heal Sam, right? 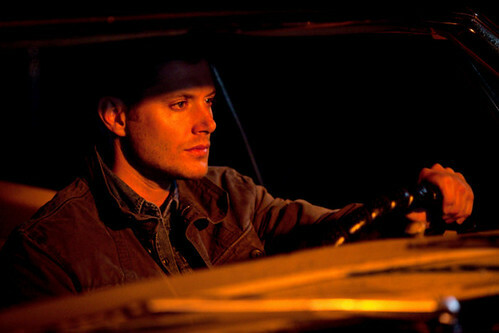 He tries Cas first, but little does he know that Cas is stuck in the middle of nowhere bumming rides from strangers. Meanwhile, Sam is having a conversation inside his head, basically debating whether it could possibly be a good idea for him to just die already, once and for all. Of course, this conversation takes place with two characters perennially coming back from the dead, Dean and Bobby, so let's take this with a grain of salt, shall we? But basically, Sam is ready to go to that great yonder, whatever that may be. Back in the land of the conscious, Dean gets his first taste of angel help in the form of an angel blade to the neck. Luckily, he has an actual angel friend that comes to his aid in the form of Ezekiel, who genuinely still believes in helping humans. But, after the fall, his angel powers are a bit on the weak side, so he can't heal Sam super speedy. Which gives some other angels time to come to Dean's call and start beating the crap out of him asking for where Castiel is. Wait, we've been here before, haven't we? And just where is Castiel? He's encountered an another fallen angel, a girl who seems to be in need of his help. Despite calling up Dean and being told the what for (basically, you can't trust the angels because they're out to get you, and you're just a human now), Castiel still wants to help her. He does actually move to listen to Dean and part ways, but it turns out she was just playing him. She wants to take over his body as a vessel and, like, do some stuff? For some reason that would make her extra strong, for the stuff? Whatevs, yo, because Castiel has more experience with people and crashes the car they're in and is like yeah, I'll stick this angel blade into you for that, girrrrl. He then goes to clean up his bloody clothes, but his stomach is agrumblin', and there's a dang vending machine with some unhealthy treats calling his name. Better steal some clothes and get some food instead. Fare thee well, trench coat. Perhaps we shall meet again someday. 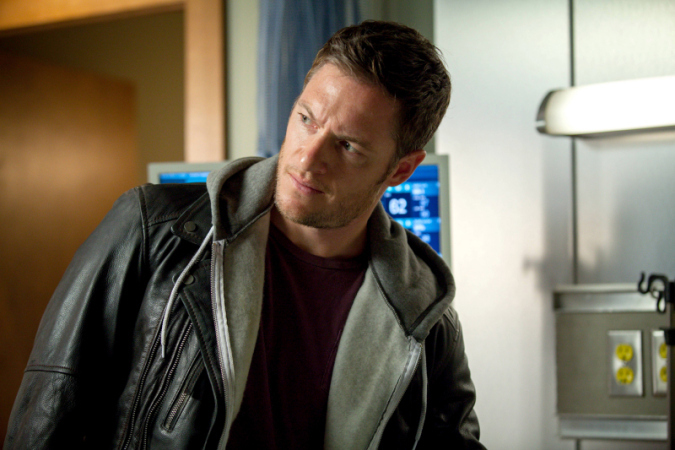 Back at the hospital, Ezekiel tells Dean that he can't heal Sam in his current state. The only way he'll be able to help is by actually possessing Sam's body and healing it from the inside. Dean is understandably reluctant to even consider this notion, knowing Sam would never agree, but we all know that Dean would do anything to keep Sam alive, so this whole back and forth about it is really just a lot of foreplay. I just included this one for the hotness factor. In Sam's head, he's ready to go. He's even having a meeting with our dear friend Death, who has come personally to take him to the great yonder. But then Dean shows up, and tells him there's a way to survive, and because he's just so dang convincing with those gorgeous green eyes, Sam is like okay. But that wasn't really Dean, that was Ezekiel playing as Dean, so Sam just agreed to be possessed. Yep, Sam is now possessed by an angel. He doesn't know it (yet), so he can't be angry about it (yet). Do we really think Ezekiel is going to let go of his possession once both of them are stronger? Things never go well when possession is involved. This was the big secret that all of the articles about the show were hinting at, and it's definitely a twist that was not super expected. It's just funny because while a twist, it's only sort of a new twist. It always seems to be Sam who ends up with some mental thing going on. Lucifer, Soulless Sam, now angel possession. Will his head never be his own? Are you excited for this season? What's the overall game plan, do you think? Somehow figure out how to re-open heaven, or something unexpected? We do know that Crowley is still around, so the demons aren't entirely out of the picture either. More angels and demons ahead, people. More angels and demons. - The new title card is pretty cool, right? Angel wings burning up. Perhaps one of the more literal title cards, but still a cool effect. - At least it was just Dream Bobby and not real Bobby. You know how I hate when they won't let dead people stay dead. - Here is my biggest problem with these angels. For example, this Hale girl. Her body was randomly deteriorating. This has never, to my memory, been a thing. Is it because they're fallen now? Also, can they now possess anyone who says yes? I thought it had to be a specific bloodline thing? Or is it just that the specific bloodline makes it so they won't deteriorate? Did I miss something or was this just kind of glossed over? Like, they made a huuuuuge deal about the Winchesters being Michael's vessel, and now Ezekiel can possess Sam just as easily? Honestly, if I missed something, please tell me. - Also, even though the angels are fallen, they still have their powers? I guess only Castiel doesn't because he had his grace taken. But do we have any other examples of fallen angels before this? Aside from Lucifer, obviously, whose situation is different. Hmm. - Some of this feels very much already tread territory. The angels have been pissed at Cas forever. 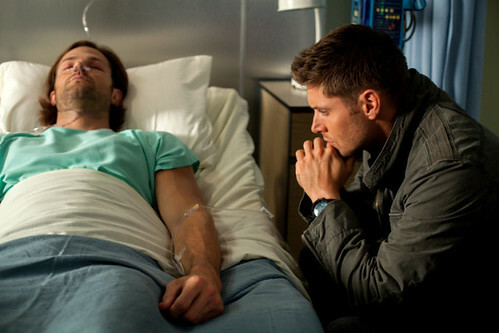 Sam is constantly having some kind of mental battle, with Dean always trying to keep him alive and harboring secrets. I suppose that's the problem with a show lasting this long, things end up getting recycled too obviously. Hopefully there are surprises ahead that shake things up. Castiel: I would fly, but I have no wings. Not anymore. Dean: Anybody ever tell you, you hit like an angel? Death: Well played, my boy. I'm pretty sure the thing with the angel possession is like, more about the body being able to contain the angel. There's a deleted scene from 4.1 in which Cas tells Dean that it took him a while to appear in a human form because it was difficult to find a vessel "durable enough to contain" him. Just like poor Nick, the first guy Lucifer possessed, his body fell apart throughout the course of the season. I think anyone who says "yes" could be possessed by an angel, but not just anyone's body could handle that possession for long. Yeah I guess there are just certain people who are more suited for particular angel possession. I just remember they made such a huge deal about Sam and Dean being the proper body suits for Lucifer and Michael because of their bloodline.